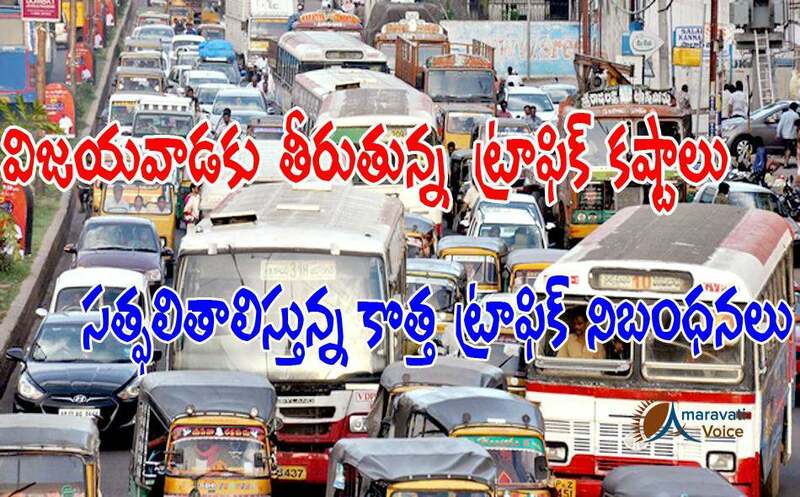 The Vijayawada traffic has increased very much and all the main roads are causing long traffic jams these days. Due to the measures taken from Vijayawada Traffic Police, atleast some of the roads in the city are having a breather now. Especially travelling on Bandar road has become very fast and easy now. Vijayawada Traffic Police has taken some measures like, closure of some traffic signal points from Police Control Room to Benz Circle. This has brought good results and the vehicles are moving quickly now on Bandar Road. Traffic police are implementing 'U' turn rule at some places on Bandar Road for smooth and speed passing of vehicles. In order to ease the traffic problem, the police have arranged U’ turns at some important places. At the remaining places, the vehicles are passing very swiftly and it takes only five to seven minutes to reach Benz circle from police control room. The closure of traffic signal points and implementing 'U' turn system was saving time and the public is also co-operating and no one has objected these actions and traffic police. Similarly based on this success, Vijayawada Traffic police is also thinking to implement the strategy in other busy road on the city.